After a recap of the events of Mighty Mutanimals (miniseries) #1, the Turtles, Splinter and April find themselves on the run from a police helicopter. They make it out of Null’s skyscraper and into a nearby alley where they fish through a charity donation bin for disguises. Leo (dressed as a rabbi), Don (dressed as an old lady), Mike (dressed as Flava Flav), Splinter (already in disguise) and April escape into Chinatown and, at Splinter’s request, decide to take their mind off the recent disappearance of Raph with a little shopping. Splinter leads them to one of his favorite haunts, the Warrior Dragon Curio Shop, only to find it on fire. The shop owner attempts to rescue his antiques from the blaze, including a strange flask shaped like a dragon, but is stopped by police for his own safety. Just then, a baby’s cry can be heard coming from the apartments above the shop and a lady in the crowd screams for her child’s life. One of the firemen on the scene, Chu Hsi, runs into the building as the fire grows even more out of control. He pulls the baby out of her crib, only to have the ceiling collapse on him. The curio shop owner can’t bear to let Chu and the baby die and hurls the dragon-shaped flask into the apartment. The flask smashes in front of Chu, releasing a green mist. The mist transforms Chu into a giant yellow dragon who returns the baby safe and sound to her mother before collapsing and reverting back to his human self. The Turtles, Splinter and April collect the unconscious Chu and receive aid from the old shop owner, who offers to help Chu recover at his home. Elsewhere, reporters are everywhere as the mysterious fire burns out of control across all of Chinatown. Only one building seems immune to the blaze and it turns out to be a front for one of the Shredders’ old warehouses. A gigantic Foot Super Soldier bursts out of the warehouse and begins stomping across the city. At the old man’s (condemned) apartment, he and Splinter nurse Chu back to health via herbs and acupuncture. The Turtles hear all the stomping and rush outside to find the giant Foot Soldier destroying fire trucks. They attempt to hurt its feet with their weapons, but have no effect. Don then comes up with the idea to climb onto its back. The Turtles do so, but find they’re having the same level of success as when they were attacking its feet. At the old man’s place, Chu finally comes to. The old man explains that contained within the flask he threw was the spirit of the great Warrior Dragon, which has now merged with Chu. Splinter asks Chu if he can summon the Warrior Dragon again to save the city. Outside, the Foot Soldier is doing his dirty work until he is disturbed by a tap on the shoulder. The tap is from the Warrior Dragon, who follows it up with a left hook to the face. 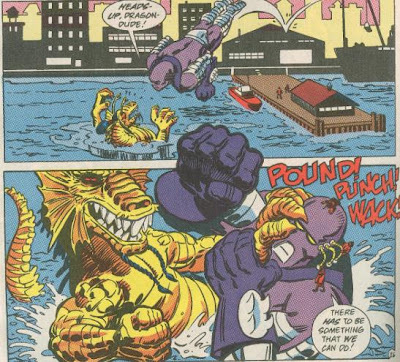 The giant Foot Soldier responds quickly by knocking the Warrior Dragon out of Chinatown and into the river. The Foot Soldier then follows him into the water and the two wrestle their way toward the Statue of Liberty. The Warrior Dragon collects the Turtles onto his shoulder, then sends the giant Foot Soldier flying toward Lady Liberty, where it is immediately impaled on her torch. Back in Chinatown, the fire has finally died. The old man and Chu thank the Turtles, Splinter and April for their help and bid them farewell. As they leave, Mike wonders if there are any pizzerias in Chinatown. *This story is continued from Mighty Mutanimals (miniseries) #1. 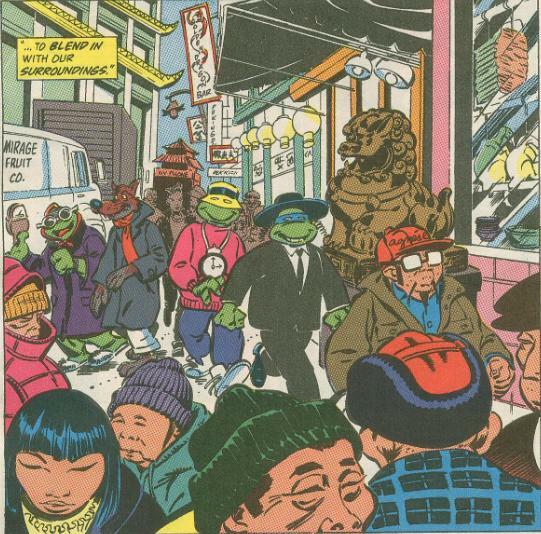 The Turtles’ story continues in TMNT Adventures #21. *A regular-sized Foot Super Soldier was last seen in TMNT Adventures #18. *Chu Hsi/Warrior Dragon will appear again in TMNT Adventures #24. *The curio shop owner is annoyingly not addressed by name in this issue. In case you may have been wondering, though, his name is "Fu Sheng". *The secret behind the mysterious warehouse and why the giant Foot Super Soldier was activated will be revealed in TMNT Adventures #22. *The van on page 6 labeled “Mirage Fruit Co.” is a reference to…aww, just take a guess. 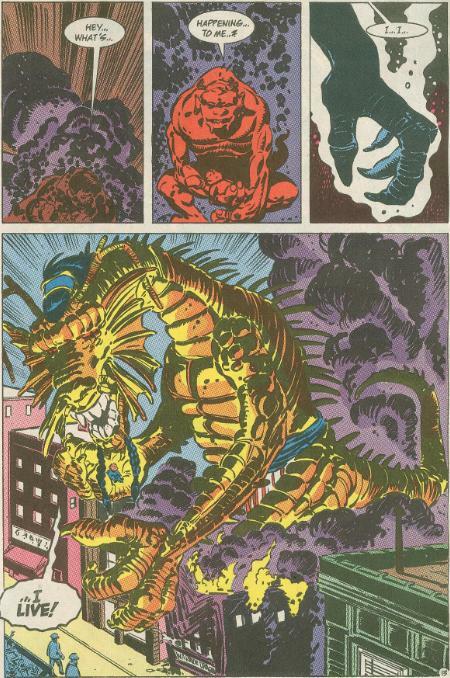 *Warrior Dragon actually originated in TMNT Magazine (Welsh) #2 with a slightly different origin. He'd go on to become Hothead in the Playmates toyline and the Konami TMNT Tournament Fighters (NES edition) video game. Albeit, in those future incarnations, he was recolored red. *This issue was published in the UK by Fleetway in TMHT Adventures #34. With all the plot threads from the last six issues being resolved in the Mighty Mutanimals miniseries, the TMNT Adventures book had to continue on with something. What we get is a pretty random toy promotion that’s almost not a toy promotion at all. Thanks to the different name and the yellow color scheme, I never made the connection that Hothead and Warrior Dragon were the same guy until I read Hothead’s toy bio (which is identical to the plot of this issue). The way I word it, I make it sound like Clarrain (Murphy) messed things up, which isn’t my intent. This issue came out in the summer of 1991, while Playmates didn’t release Hothead’s toy until 1992. Likely, all the alterations made to the character were the fault of Playmates. Anyhow, toy ramblings aside, this is an issue that has always just screamed “filler” to me. Warrior Dragon was never utilized much in the series, so having an issue revolve around him just feels dull. 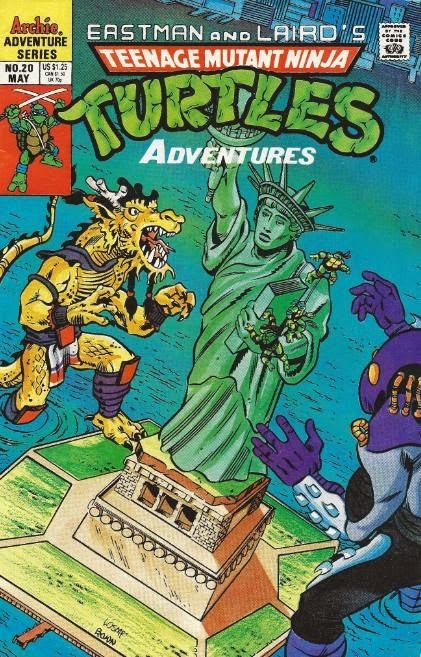 Since Mighty Mutanimals is off doing its thing with all the story that had been built up for a year, TMNT Adventures was sort of just left with the scraps, trying to get by until the tie-in miniseries was over. Not a great time for the book, all things considered. Bill Wray’s art is somewhat unusual. His Splinter and April look very consistent with how Mitchroney and others draw them, but his Turtles look like they were copied from action figure cards and other pieces of stock art. At the beginning of the issue, the Turtles are constantly making their trademarked gnash-teeth grimace while Leo won’t stop holding his damn katana in the air in the most awkward fashion imaginable. Strangely, Wray’s Turtles actually improve once they put on their goofy disguises. To Wray’s credit, Warrior Dragon looks pretty tight, with the three-man inking crew doing a phenomenal job (particularly on pages 12-14). Anyhow, TMNT Adventures is going to be the lesser of the two titles for the next few issues, not really getting back on track until after the Mutanimals miniseries is over. While these issues aren’t terrible by any means, they just aren’t especially good. I always loved this episode. Normally I liked the standalone episodes less well and prefered the ones who were continuing a storyline.. But this one I found really nice, mostly because of that awesome dragon! !